"Sangha building is crucial. If you are without a sangha you lose your practice very soon." Pennsylvania Community of Mindful Living! On this site you will find information about Buddhist Sanghas (communities of spiritual friends) throughout the Commonwealth, practicing in the tradition of Zen Master Thich Nhat Hanh and the Order of Interbeing. The Community of Mindful Living (CML) was formed in 1983 to promote and support the practice of mindfulness for individuals, families, and societies. In 1999, CML became part of the Unified Buddhist Church. 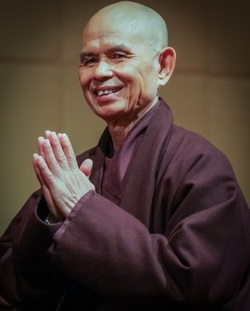 We are a four-fold community in which members support one another's personal and spiritual unfolding while exploring Buddhism in the tradition of the Vietnamese Zen Master, Thich Nhat Hanh. We remain open to truths from all other sources. We come together to meditate, share insights, ask questions and find a peaceful refuge without fear of judgment or rejection. Our community aspires to live the way of mindfulness, which leads to an awakened life of joy and compassion for ourselves and all beings. Our practice is to maintain mindfulness of body, feelings, mind and the world by looking deeply and bringing our awareness to the present moment, from sitting meditation to washing the dishes. Please learn more about us and our practice and resources through the links on our site.